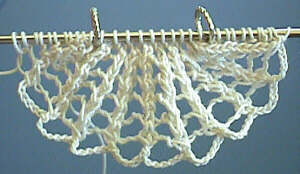 This pattern was developed as part of an analysis of a lace pattern by the Knitted-Lace List members. A full writeup of the Shell Edging Deconstruction project is archived on the Knitted-Lace Home Page. The finished bookmark, as shown in size FF silk beading thread worked on needle size 0000, measures about 2.5 inches wide and just over 7 inches long. In size 20 cotton thread on 00's it is about 3 inches wide. It can, of course, be worked to any length. This bookmark is made by knitting the scallop shell on the lower end, picking up stitches along the sides and base of the shell and knitting upwards, back and forth across the full width for as many repeats of the shell pattern as desired. One final repeat of the shells is worked, knitting another scallop shell in the center instead of the cowries and eyelet triangle that are part of the main pattern. Because various parts of the separate patterns are repeated later, on the first occurrence I'll label it with the pattern name and row number, (like "cowrie 4" for the 4th row of the cowrie pattern), for later reference. For this pattern, I think the written-out version is fairly easy to follow, and a chart would be difficult, so I'm not giving a chart. "ssk" means "slip, slip, knit"--that is, slip 2 sts one at a time as if to knit, put left needle through the front of these two sts, and knit them together through their back loops. "s2kp" means slip 2 (together, as if to knit), knit one, pass the two slipped stitches over. "OO" means two yarnovers. At the beginning of a row this is done by wrapping the thread twice around the needle before working the SSK. It makes a large decorative loop on the outer edge of the lace, which is knitted only once on the return row. "kd" means "knit and drop"-- used for working the OO you come to at the end of each row: knit the first loop and drop the other. This makes the decorative outer loops. "Shell back" means the standard plain back side (the even numbered rows) of the shell pattern, which are all worked like this: OO, ssk, (k1, p1 into OO), k across to marker. "x 9" means work the indicated instruction nine times altogether. I've used vertical bars to separate the center cowrie panel from the outer shell edgings. You'll have a ring marker on your needle at each of these two points. Within the shell edging instructions, I've used semicolons to separate the eyelet triangle, the shell itself, and the outer loopy trim. Using invisible cast-on, cast on 10 sts. Purl one row and tie knot with cast-on tail. Crochet off the stitches, grouping the 3 sts at the end of each rib into a single crochet (that is, pull one loop through the 3 sts and then pull a loop through that loop), and chaining 6 sts between them; end chain 2. Put the last crochet loop onto your right knitting needle, run another needle through the five loops along the edge of the scallop, and knit up along the side of the shell by working (yo, k1 through edge loop) x5 [11 sts]. When you reach the cast-on sts, place a ring marker, then place the cast-on sts onto a needle, remove the holding thread, and knit the 10 sts and place another ring marker [21 sts]. If you had an extra loop from the cast-on, knit it; if not, knit a stitch into whatever thread you can find. Then run the left needle through the five outer loops on the remaining side and (yo, k into edge loop) as before [32 sts]. You should have 11 + 10 + 11 stitches on your needle. Row 1, first time only-- shell back: OO, ssk, k to marker | Center: p 10 | Shell 1: yo; k8; OO, ssk, kd. Row 1, later repeats-- shell back | Cowrie 1: k2, p6, k2 | Shell 1: yo; k8; OO, ssk, kd. Row 2-- shell back | Cowrie 2: k 10 | Shell 1. Row 3-- shell back | Cowrie 3 (crossover): k2, p6 loosely, reach past the first 3 sts on the right needle, and one by one lift the next 3 sts over them, k2 | Shell 3: yo, k1, yo; k9; OO, ssk, kd. Row 4*-- shell back | Cowrie 4 (rebuild): k2, yo, k1, yo, k2, yo, k2 | Shell 3. Row 5-- shell back | Cowrie 5: k2, p6, k2 | Shell 5: yo, k1, (yo, ssk), yo; k 10; OO, ssk, kd. Row 6-- shell back | Cowrie 6: k 10 | Shell 5. Row 7-- shell back | Cowrie 1 | Shell 7: yo, k1, (yo, ssk)x2, yo; k 11, OO, ssk, kd. Row 8-- shell back | Cowrie 2 | Shell 7. Row 9-- shell back | Cowrie 3 (crossover) | Shell 9: yo, k1, (yo, ssk)x3, yo; k12; OO, ssk, kd. Row 10-- shell back | Cowrie 4 (rebuild) | Shell 9. Row 11-- shell back | Cowrie 5 | Shell 11: yo, ssk, k8, slide last st back onto left ndl and pull the next 13 sts over it, ssk, kd. Row 12-- OO, ssk, k to marker | Cowrie 6 | Shell 11. *Optional improvement to the cowrie part of row 4: change central increase to one that doesn't show a hole, like this: k2, yo, k1, k into front and back of st, k1, yo, k2. However, the YO version is much easier to work if things are very tight, and the hole doesn't show all that much. You will now work the final repeat of the shell edging, omitting the triangles of eyelets, and inserting the scallop shell finish on the ten center stitches, in place of the cowrie shell center. Row 1-- OO, ssk, k to marker | Scallop 1: p10 | Shell 1: k8; OO, ssk, kd. Row 2-- shell back | Scallop 2: (yo, k1) x10, yo | Shell 1. Row 3-- shell back | Scallop 3: p1, (p1, p1k1 in yo) x9, p2 | Shell 3: k9; OO, ssk, kd. Row 4-- shell back | Scallop 4: yo, (s2kp, OO) x9, end s2kp, yo | Shell 3. Row 5-- shell back | Scallop 3 | Shell 5: k 10; OO, ssk, kd. Row 6-- shell back | Scallop 4 | Shell 5. Row 7-- shell back | Scallop 3 | Shell 7: k 11, OO, ssk, kd. Row 8-- shell back | Scallop 4 | Shell 7. Row 9-- shell back | Scallop 3 | Shell 9: k12; OO, ssk, kd. Row 10-- shell back | Scallop 4 | Shell 9. Row 11-- shell back | Scallop 3| Shell 11: remove ring marker, k1, slide last st back onto left ndl and pull the next 13 sts over it, ssk, kd. Row 12-- s2kp, put st. back on left needle. Crochet off the end of the scallop, taking the 3 sts at the end of each rib in a sc and chaining 6 ch between, ending with the sc. Remove ring marker. Place last ch on right needle, k1, put this back on the left ndl and pass 13 sts over it, ssk, kd. Turn and s2kp. One st remains; cut thread, fasten off, and hide end. Copyright statement: This is an original design by Judy Gibson, July 1, 2000. Permission is granted to print and use this pattern for personal noncommercial use, provided this notice is included. No commercial use or publication of this design--in hard copy or electronic form--are permitted without explicit consent from the designer. Contact: Email to jgibson (at) cts (dot) com.